For retail banks, it’s increasingly challenging to differentiate in today’s crowded financial landscape. While most financial institutions offer unique levels of service around their offerings, many have difficulty effectively communicating their distinguishing factors, and the average consumer simply cannot distinguish between options. 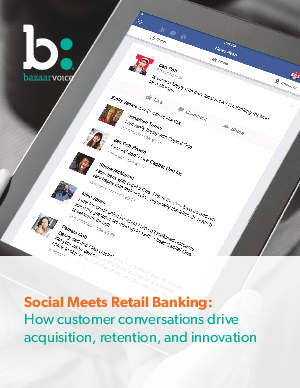 In our connected economy, banks are faced with a massive opportunity to redefine their brand and earn new customers by opening up their walls and tapping into consumer conversations via social. Like never before, social lets people connect directly with brands and consumers are telling brands exactly how to win their loyalty for life. Leading banks can use social data to uncover what’s most important to the people behind it—helping them understand precisely how to earn brand loyalty, advocacy—and drive revenues.